Fluence designs, manufactures, and supplies modular, containerized water treatment plants for the municipal and industrial sectors. 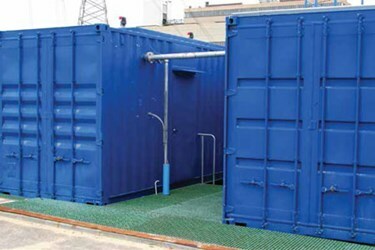 Pre-assembled, containerized modules enable fast installation and commissioning. Skid-mounted pre-treatment systems and RO units are shipped to site after complete validation testing at our production facility. Systems are supplied with central control systems for easy operation and remote monitoring. Fully containerized plants can be designed for simple relocation — enabling the plants to be dismantled, transported, and then reassembled at a different location. When the plant is removed from the site, there will be no trace of the complex water treatment system left behind. Fluence designs systems to meet clients’ specific needs — from self-contained systems to modular plants. Our small to medium size desalination plants have capacities from 150 m3to 50,000 m3 per day. Treating Water for Municipal Use: State-of-the-art RO desalination systems produce drinking water from almost any source, including sea, surface and brackish water. Energy recovery systems reduce energy requirements by up to 40%, resulting in more economical production of drinking water. Treating Water for Industrial Applications: Advanced treatment systems deliver processed water for the food and beverage, oil and gas, power, and other industries. Fluence utilizes a wide range of technologies including electro-deionization (EDI), meeting stringent international standards. Treating Effluents Prior to Reuse or Discharge: Compact treatment plants provide on-site treatment of municipal and industrial wastewater. The fully automated plants enable rapid deployment and require minimal operator intervention. The cost-efficient systems do not require extensive local infrastructure and offer low operational costs. Packaged wastewater treatment plants are custom configured, using proven designs and components to treat virtually any amount of wastewater.